The idea that the amount of dark matter is increasing with time kind of reminds me of The Nothing in The Never-Ending Story. Re: Where is Moon Child? "I didn't get around to finishing that book, so it lived up to its name"
They made a mistake and added an ending to the film. That's why they had to make "The Neverending Story Part 2". Actually there is a part 3. Ancient galaxies have less dark matter, new galaxies have more. But when we see an ancient galaxy, we see it a long long time ago, when it was actually young. Obviously, dark matter is just stars that have worn out. Flat batteries, probably. I have the same trouble with my torch. That's close enough to the MACHO theory I think that it can be ruled out for the same reasons: if there were lots or dead stars we would observe them through gravitational microlensing events, and we don't see enough of those. I seem to have upset a lot of astrophysicists - anyone care to explain why? Or was the coat not indication enough that I wasn't being serious? It must be seasonal. The literalists have been coming out of the woodwork lately. You didn't upset me, I realised it was a joke! But it's also an interesting idea which is why I answered. I think you're utterly wrong. Though I didn't downvote you. I think you'll find that dark matter isn't there in young galaxies because they're footloose and fancy free. It's when they start to age, that all the existential dread comes in, from children mortgages, fear of impending doom etc. Thus dark matter = existential dread. I'll take my Nobel grant in beer thanks. Basically it's depressed galaxies. I like this theory. Do these galaxies have a pain in the diodes stars down their left side? Has a certain "plastic pal who's fun to be with"©®™ visited there? I think they, being galaxies and all, know the answer to the Fermi paradox: it is, pretty much, just us. And they're watching us commit suicide as a species: who wouldn't be depressed? > Basically it's depressed galaxies. I like this theory. Or a paranoid android with a brain the size of a galaxy. I thought the dark stuff originates from St. James's Gate in Dublin? I think Dublin is just an over-priced visitors' centre nowadays - and it's actually made in Cork. Although perhaps they know something about cosmology that the rest of us don't? It is pitch black. You are in danger of being eaten by a... Chomp! we reverse the polarity in the CCD array the dark will momentarily become light and be easily seen. This works well in the movies and science imitates science fiction. (I do actually test full 330 watt bi-facial PV modules this way) feed in rather a lot of amps& volts; they glow, a bit, mostly IR, but can be photographed and reveal amorphous or crystalline silicon defects. Not sure if reverse electroluminescence of a CCD would illuminate much dark-matter, or remote galaxies, but worth a try. Thursday 13th December 2018 08:16 GMT sorry, what? At best, it just seems to modify the existing riddle. Why do most old galaxies have little dark matter? We still don't know what dark matter is. Or even if it exists as a substance. Exactly, isn't this just one aberrant point on the graph - the reading that would normally be regarded as unreliable in a pool of consistency? I would suggest the conclusions as reported are 'excessively optimistic'. I *think* what they mean is that this is the first old galaxy we've been able to measure in this way (because of the angle), and previous results suggesting low levels of dark matter in old galaxies were using less precise methods (at a guess that'd be something like gravitational lensing, the rotation at the outer edges only, or trying to infer the effects on nearby galaxies). You may be correct that Accuracy and method may be different but one of the earlier investigations was 240 disks not just the one and they did have the accuracy to measure angular velocity at various radii ... I still think there's more work needed to prove the conclusion based on only one observation. "Exactly, isn't this just one aberrant point on the graph"
An entire galaxy is a pretty big point. "An entire galaxy is a pretty big point." Even an entire galaxy is just a Mote in the Universes Eye. I was also wondering if I missed the part of the riddle being explained. Seems to me like the absent dark matter in all the other old galaxies is still unexplained. I opened this article thinking that scientists had finally explained dark matter. Not at all, they just found an old galaxy with present-day amounts of the stuff. All well and good, and now it must be asked what measurement error made us misinterpret the data on all the other old galaxies, but this does nothing to explain dark matter. I'll explain dark matter for you then. It is matter, that's dark. Its the FSM's noodly tendrils, I've been saying this all day. Our galaxy is one of the younger ones? We have stars that are almost as old as the universe. A quick google tells me our galaxy is a mere 300 million years younger than the universe and if the big bang theory is correct, part of the first 300 million years were the dark days of massive inflation. In astronomy it's so easy, young or old, to drop a bunch of zeroes in front of the decimal point. Right. Well 'part of the first 300 million years' means 'from 10E-36 to about 10E-32 seconds after the big bang' so ... quite a small part. What you might mean is the surface of last scattering, which is the point where the universe got cool enough for light to propagate -- when it was cool enough for electrons and protons to combine into Hydrogen in other words. This is what we're looking at when we look at the CMB, and it's about 380,000 years after the big bang. I'm amazed that the words "a galaxy *created* about 9.6 billion years ago" has not resulted in 9.7 billion pages of anti-creationist commentary yet. The topic must be getting old. 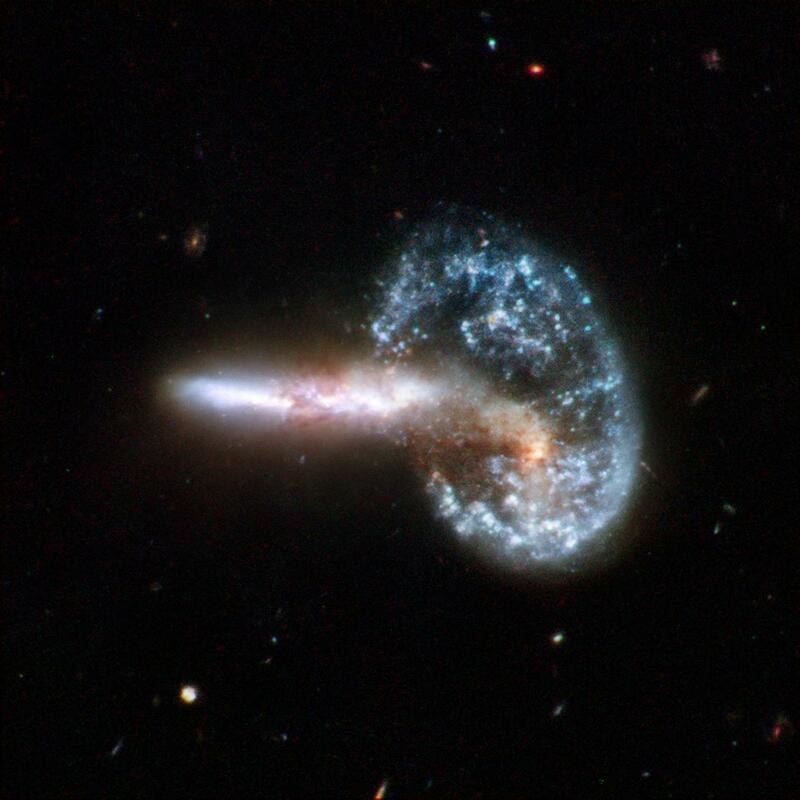 "Galactic Accident" in the title referred to a cosmic prang seen all too often when those in charge of galaxies fail to watch where they are going. Really, really, really! You put them in charge of a galaxy and they think they are rulers of the universe! The problem is these modern self-driving galaxies that people insist on testing out on the public space-time continuum. They're dangerous. At this rate we'll have to build more hyperspace bypasses. Dark Matter is simple - it's Mantrid's Drones. I Left some DARK MATTER for them to find this morning. All those jokes comparing dark matter to phlogiston and some serious boffins go on and say 'you know what, it is phlogiston! As I understand it, current theories of galaxy formation need dark matter in the primordial mix to work well, but the earlier studies found DM was lacking in the first three billenia, and this fact is vexxing. The theory has a big hole in it. Now someone has found a galaxy, almost old enough to be classed in that era, that has plenty of DM. That's very interesting, but how does this discovery negate the problem presented by the other old galaxies they found lacking DM? The article seems to imply this find fixes the DM theory problem, but does it really? Is it dark matter? Really? We've still to capture or measure any. It sounds like we have come all the way back to the concept of Aether. And that was just a name for "we don't know how the **** this happens". Giving it a new millenial name doesn't change what it is. Perhaps its just our poor monkey brains trying to make sense of an Ndimensional universe through a 4d set of goggles. Can we just call it Magic and have done? It's different than aether, because while we have no idea what it is we can detect it. So, yes, we can measure it: we can look at galactic rotation curves and infer from them how much dark matter must be there. This is essentially the same trick we did to discover Neptune and Pluto: look at some stuff we can see, infer things about the gravitational field from their motion and infer there must be some other thing we can't see. Of course, in the case of Neptune & Pluto we did see them when we looked hard enough. The trouble with aether was that it turned out that there was no way to detect it even in principle, and some smart guy decided that things which you could not detect, even in principle, were not there. He did this trick several times with different things: it's a good trick. "DARK MATTER" IS FAKE SCIENCE! The Universe is a simulation a bit like The Matrix. The increased Dark Matter in the newer galaxies is because they're running over budget and they're short of hard drive space. Gaps in the simulation which manifests itself as "Dark Matter". "The Universe is a simulation a bit like The Matrix." So there are sequel universes, each one worse than it's predecessor and without any stars? Or possibly like in the film "the Thirteenth Floor" where simulations are nested within simulations. Galaxies rotate slower at the outside than nearer the centre, It's obviously a wind-up. Do they zip it up when they aren't using it?